For Earth Day CSP & I changed out all the regular bulbs in our house to CFLs , or swirly bulbs as we call them. Just the downstairs alone that was 17 bulbs! They are brighter and whiter than the old school bulbs plus our electric bill will go down I’m sure. We received 2 packages of free CFL bulbs from our electric company so that really helps with the cost. Check with your power company, they may have a similar program. 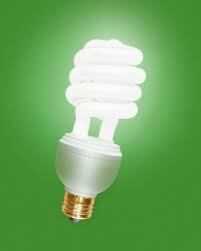 And since CFLs last forever, we won’t have to replace them for years and years. We’re headed upstairs to change out those bulbs next!